Earthquake Prediction: Bali earthquake latest news: Are earthquakes still happening in Bali and Lombok today? Bali earthquake latest news: Are earthquakes still happening in Bali and Lombok today? INDONESIA has been hit by six huge earthquakes in the past two days, leaving at least 142 people dead. Here are the latest news from Bali and Lombok. Since last night, three earthquakes have hit Indonesia, where one was recorder at 5.0 magnitude. The other two recorded at 4.5 magnitude according to USGS. One was felt far off the coast while the other was on land in Karangsubagan. There is still a high risk of aftershocks in the coming days and weeks, and people are urged to read up on risks if they are planning to visit the area. There have been more than 130 aftershocks since the quake hit on Sunday morning and a tsunami warning was also issued - although this was lifted after a few hours. Indonesia is defined by string of volatile volcanoes stretching for thousands of miles, as it is situated on the so-called Ring of Fire around the Pacific. This means volcanic eruptions and earthquakes occur regularly and can present a potential threat of tsunamis. Indonesian rescue workers were still struggling Tuesday to reach the northern part of Lombok island, which was struck by a major 6.9 magnitude earthquake Sunday. The earthquake struck just 18 miles underground, causing catastrophic damage to thousands of buildings and triggered power cuts. The death toll is expected to grow according to authorities, as more bodies could be found when clearing debris and crumbled buildings. Two earthquakes in quick succession in eastern Indonesia have cost dozens of lives on the island of Lombok and on neighbouring islands. 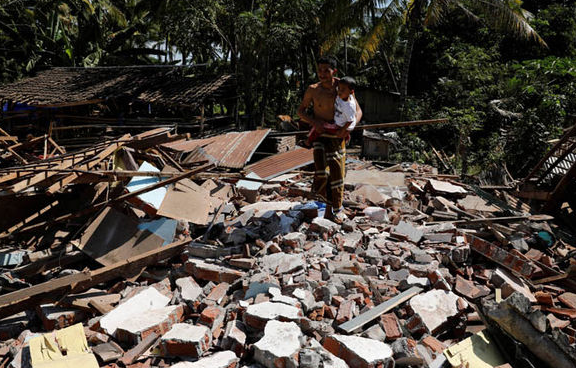 Bali has also sustained damage, where two were confirmed dead after tremors struck. The Foreign Office has issued advice for travellers planning to visit Bali. Official advcie reads: “If you’re planning to travel to Bali, Lombok or the Gili Islands in the coming days, you should keep your travel plans under close review and seek the advice of your transport and accommodation providers before travelling, and ensure that you have contingency plans and travel insurance in place. “You should also be mindful of the risk of aftershocks in the coming days and weeks. You can read Foreign Office’s full travel advice plan here. If you are already in the area and need consular assistance, call the British Consulate in Bali on +62 21 2356 5200.